Flying the F4U Corsair video contains four World War II era films and the F4U Corsair pilot's manual. Film #1 is How to Fly the Vought F4U Corsair and is a training film for F4U pilots. Learn how to fly the fastest and most powerful carrier fighter of World War II. Covers everything from preflight check through touchdown. 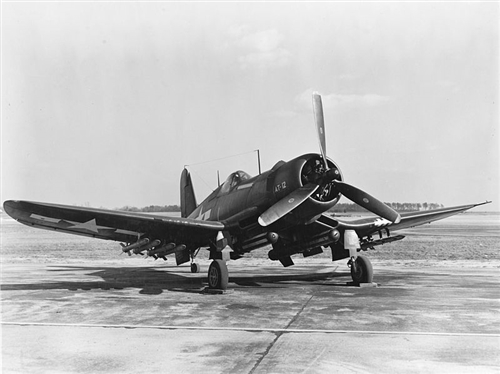 See the Corsair perform a loop-the-loop. This was the plane flown by Pappy Boyington's infamous Black Sheep VMF-214 Marine squadron. Initially rejected by the US Navy as a carrier fighter, it was loved by island-based marine squadrons who found it to be both an excellent air superiority fighter and outstanding ground support bomber, a trait much prized and loved by the Corps. Known to the Japanese as Whistling Death for good reason, the F4U had an amazing 11:1 kill ratio. The Corsair went on to perform with distinction through the Korean War and with the French in Indochina. In B+W with a run time of about 21 minutes. Film #2 is Offensive Fighter Tactics. Learn the tactics US Navy fighter pilots developed -- the hard way -- during the first two years of the war against the nimble Japanese Zero. This World War II vintage pilot training film covers everything from situational awareness, assessing enemy capabilities, to one-on-one dog fights and squadron tactics. Full of detailed illustrations and examples. A must have for virtual combat pilots and World War II fighter enthusiasts alike! In color with a run time of about 21 minutes. Film #3 is Hook Down, Wheels Down. This fine documentary was produced by the Department of the Navy to celebrate the first 50 years of carrier based aviation, with an emphasis on World War II operations. The Navy Archives were opened to provide footage ranging from precarious landings on the old Langley to the Battle of the Coral Sea, to CVEs facing the Japanese at Leyte Gulf and more. Along with some great Navy action, the highlight of the film are the numerous interviews with famous naval aviators, including George Gay, the only survivor at Midway from Torpedo Squadron 8, John Thatch, who tells how he invented the famous "Thatch Weave," Gene Valencia, a top USN ace, and Adm Wade McClusky, also of Midway fame. In color with a run time of about 55 minutes. Film #4 is the The Saga of the Franklin. This inspiring documentary shows how the gallant officers and men of the distinguished Essex class carrier USS Franklin overcame incredible battle damage inflicted by a devastating bomb hit to save their ship. Remarkably, combat cameramen happened to be aboard ship to capture the action.The film also contains rare and informative color footage of late war Vought F4U Corsair and Curtiss SB2C Helldiver carrier operations right off the coast of Japan. Perhaps most memorably, you'll see the officers and men of the USS Franklin first ably going about their daily business and then catapulted by fate performing selfless acts of heroism under extraordinary circumstances. In color with a run time of about 24 minutes. A 64-page F4U Corsair pilot's manual is included on the DVD. It is in .pdf file format with photos, systems diagrams, performance charts, flight procedures & more. The manual can be accessed on a computer equipped with a DVD drive.